I took a quick trip down to Lockhart to gather some Kreuz jalapano cheese sausage and, of course, made a few other stops on the way. My buddy Trey came along for his first central Texas BBQ trip and he seemed to enjoy the ride. On the way down Wednesday we stopped at Miller's in Belton so he could grab a sliced brisket sandwich to hold back his hunger pangs. Trey pronounced it a very good sandwich with some light smoke flavor. Dinner was Black's, of course, and it was a winner across the board for me. The brisket was excellent as always, with perfectly rendered fat that was delicious. The ribs were spot on with a bite mark that would gather a 9 from any KCBS judge. My jalapeno cheese link was slightly mushy, but with a nice flavor. Trey opined that Miller's had a little more smoke flavor, but I was tasting smoke for hours afterwards so I had no complaints! Lunch the next morning was at City Market in Luling and I was once again disappointed by their brisket. Chewy, failed the pull-apart test, unrendered rubbery fat, and no smoke flavor was the diagnosis. I left some uneaten. The ribs were outstanding and so was my hot ring. On the way out we swung by Blacks to pick up a couple of 4 pound frozen moist briskets. They have a second register inside the pit room now so you can skip the line and come in through the dining room for to-go orders. Very nice. We also noticed a big TV crew was in residence at Smitty's. All kinds of big AV trucks outside. 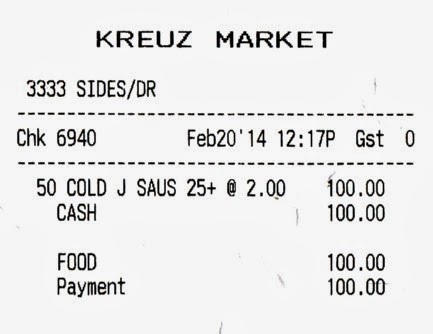 Next on to Kreuz for 2 boxes of my favorite sausage. The lady was kind enough to vacuum seal all 50 links and I'll see how those hold up in the freezer. That's the first time I have gotten the vacuum sealed packaging. The price is now up to $2/link for cold jalapeno cheese. Still a bargain in my book. 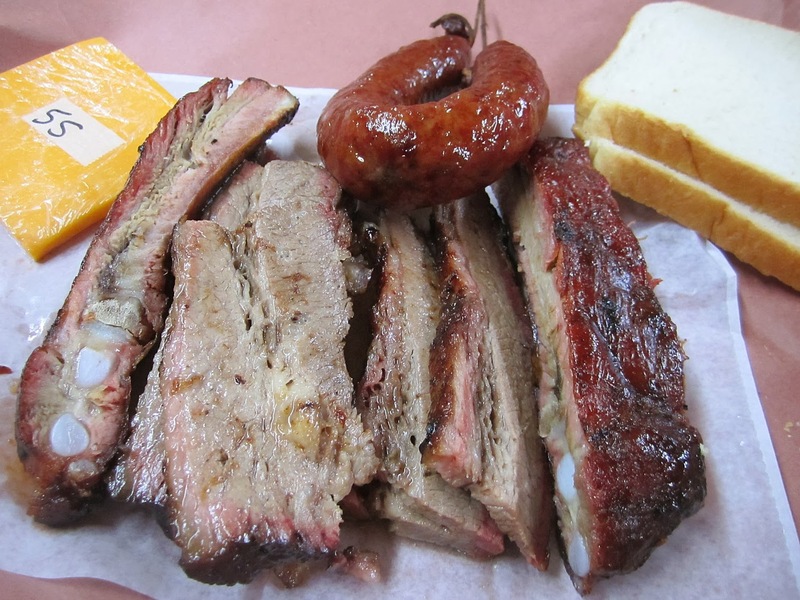 On the way back we stopped by Miller's in Belton again and got some more sliced brisket to go. My quality control bites produced a smile on my face. I'll be enjoying that over the next few days. I had a taste of their sauce and it seems to be much improved over what I tasted there before. Very sweet with a nice heat finish. I don't know if I will use it on their excellent brisket, but I will use it on something! 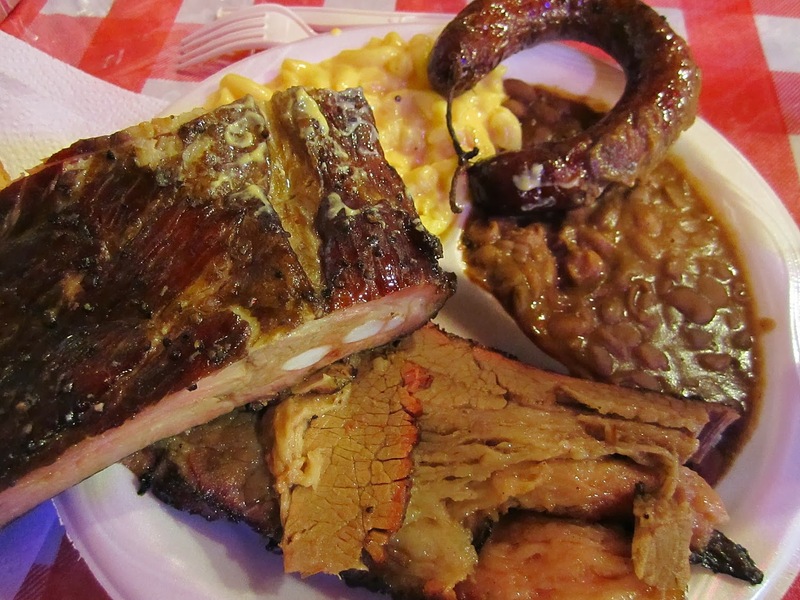 Tickets go on sale Monday for the second Annual Houston BBQ Festival on Sunday, April 6. The first one was a lot of fun so I suspect we'll be there again!